Twenty-eight researchers, including faculty and students, from the University of Chicago and other collaborating universities and scientists from Fermilab and Argonne National Laboratory have returned from the South Pole after spending more than three months installing the third-generation camera of the South Pole Telescope. This camera, known as SPT3G, is a polarization-sensitive microwave camera that maps the cosmic microwave background, light left over from the Big Bang. The Maroon sat down with Astronomy and Astrophysics Professor Bradford Benson to discuss the research being conducted at the South Pole. Chicago Maroon: Could you talk to me a little bit about where you were stationed? Bradford Benson: We were at the Amundsen-Scott South Pole Station, which is a couple hundred feet from the geographic South Pole. There’s a base there with beds for about 150 people which operates as a base of operations for most of the U.S.–Antarctic science towards the center of the continent. The base is focused on astrophysics and atmospheric science because of the unique location. CM: Speaking of the unique location, why would you choose the South Pole for research? BB: We're studying the cosmic microwave background, which is the light left over from the Big Bang. This light is brightest in the microwaves, for which the atmosphere is pretty transparent, but water vapor is one of the main atmospheric components that absorbs microwaves. It turns out the South Pole is unique because the atmosphere is both extremely dry and stable. During the South Pole winter, the temperature drops down to -100 degrees Fahrenheit, which is so cold that water vapor freezes out of the atmosphere. Also, once the sun sets, it's down for six months straight, so there's not this rising and setting where the sun comes up and stirs up the atmosphere. So those two things are the key components for why it's the best place in the world for microwave observations. 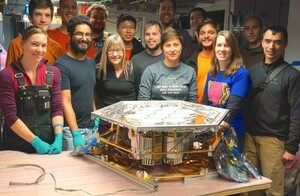 A picture of the team at the South Pole in front of the new SPT-3G camera. CM: Could you elaborate on this research that you were conducting at the South Pole? BB: The main scientific goals of this camera are, number one, to understand the physics behind the Big Bang better—in particular, to try to understand and test this theory of inflation. We think shortly after the Big Bang happened, the universe expanded exponentially such that in a fraction of a second, the universe went from the size of an atom to something comparable to its size today. In particular, the theory predicts that it would have created a certain pattern in the polarization of the microwave light from the Big Bang. We're trying to make a deep enough map to see this pattern to actually test if this theory of inflation accurately explains the physics of the Big Bang. The second goal is really to understand neutrinos better. Neutrinos are very elusive light particles that are the second most abundant particle in the universe to photons, or light. Most of the neutrinos in the universe were generated shortly after the Big Bang. In addition, they are also generated in any sort of nuclear reaction—the sun, particle accelerators, anything with fission or fusion reactions also typically generate neutrinos. Our measurements are now at a level of precision that to actually fit the data well, we need an extra parameter to describe neutrinos. Even our predictions now need neutrinos to match the observations, and the precision of our measurements are so good that we can actually test the physics of neutrinos in a way that really pushes beyond what people can do today in particle accelerators. CM: So how does the new camera contribute to this research? BB: ﻿One thing that's driven all these measurements is technical advancements. When we make these images of the microwave background, we are getting a unique look of the universe as it looked shortly after the Big Bang. With better measurements, we can see fainter, finer details that give us more information about the early universe. As physicists in our field, to make better measurements, we need to make more sensitive detectors. The big advance with this camera is that it has many more detectors, compared to the previous generation camera; we went from 1,600 to 16,000 detectors, so that’s 10 times faster than the previous generation camera. That allows us to make more precise maps of the very early universe to better understand its contents and also the physics behind the Big Bang. 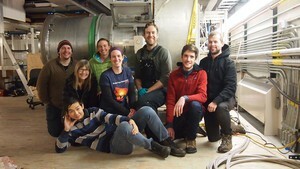 A picture of the team at the South Pole in front of the SPT-3G focal plane of microwave detectors. CM: ﻿Were there any challenges that you faced while researching at the South Pole and working on the camera? BB: ﻿For us, part of the challenge is always the schedule. We have a limited amount of time to set up everything and install it; it; the South Pole is only accessible from early November to mid-February, after which point it becomes too cold for planes to take off or land. We have to cool the detectors of the camera to a quarter degree of absolute zero, and it's quite a large camera, so it takes a long time to cool, and we can only do it so many times over those few months. Basically, instead of being a little CCD [charge coupled device] of small detectors like the one in your camera, our detectors take up about half a meter in diameter, so it's a pretty big object. The camera sort of looks like a supersized camera with a telephoto lens on the front, where there's this square-rectangular back part and then a long tube of lenses on the front of it. In this case, the camera is about eight feet long and weighs about 2,500 pounds. To actually cool down the detectors to this temperature takes about a week. So it's always pretty challenging as far as that goes, especially in this case where there was a new camera. 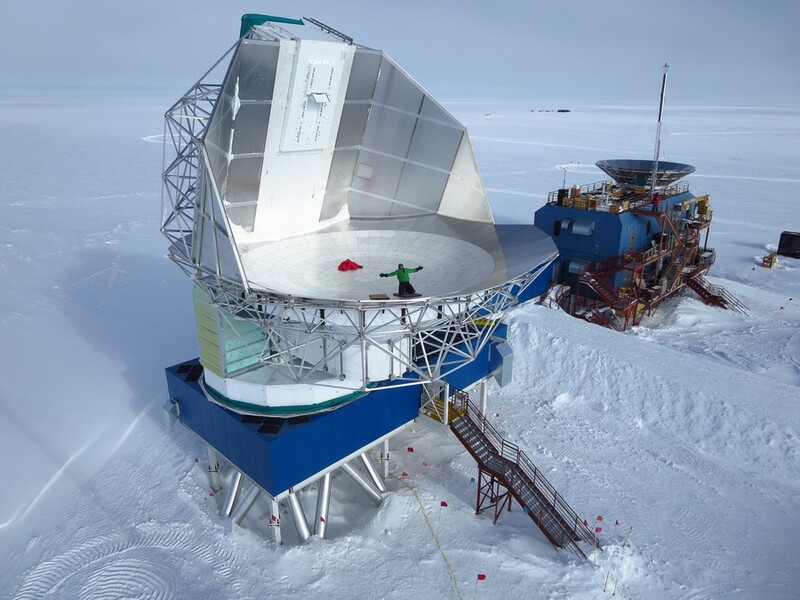 There were a lot of new components to it…ultimately, we didn't get it on the telescope until January 30, a couple weeks away from the end of the South Pole season. There's not much time in case anything goes wrong, and there's not much time to characterize it before we leave. Even now, there’s two people we behind, or winter-overs, who run and operate the telescope. Right now, they're trying to understand and characterize the instrument, trying to improve its performance because we didn't get a chance to fully optimize that before we left. CM: ﻿Do you have any special or unique memories from your time at the South Pole? BB: We've been working on building and developing the technology for this camera every four years, so it's a big payoff to go down there, install it, and see it in action. But I guess, in addition, there are a lot of distinguished visitors that come through the South Pole at various points as part of a tour or to promote science and different causes. So this year, when I was flying down, Secretary of State John Kerry flew down on my plane and gave a talk the first day I was down there, so that was sort of fun. A few years ago, I met Prince Harry, and he'd skied in and we got to give him a tour. Prince Albert of Monaco was down there, and I gave him a tour too a few years before that. So we also get this opportunity to randomly meet these world figures that just happen to come down there. "To achieve higher precision after that (if needed) one would have to go to space."